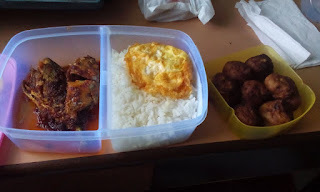 Dearest husband uploaded a picture of his lunchbox that I prepared for him today on Facebook. "Hi where is vegetables and fruits. Please add more la"
When you're friends on Facebook with your Nutrition lecturer... Hahahah. Okay, okay... I'll add on more fruits and vegies next time. You're most welcome :) Ala lagipun I'm joining the top commentor contest pun :) No harm in reading and dropping comments anyway. ye la bash, cant see any in green colour !